Spring is filled with blooms in blue, white and yellow and for one to stand out it needs some special quality. 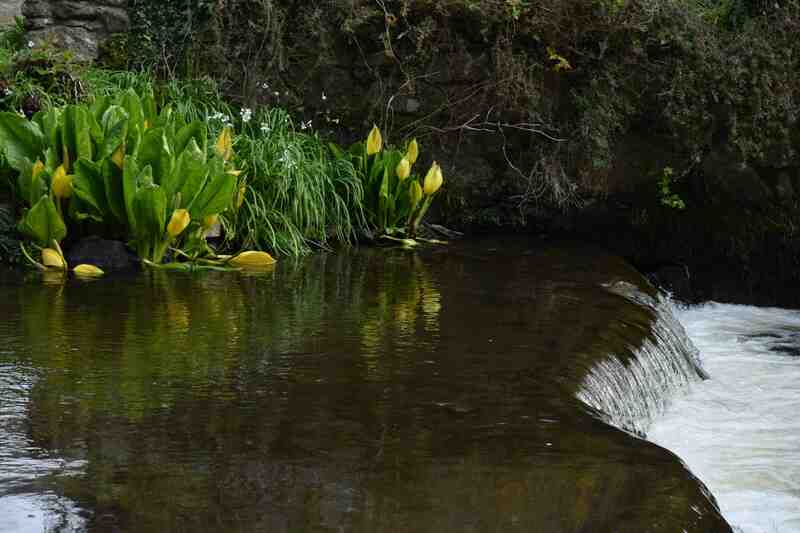 And with Lysichiton americanus, the western skunk cabbage (or more commonly just skunk cabbage) that quality is size. This plant is huge! It is a relatively common plant in cultivation in the the UK and Ireland and yet it is not grown in many private gardens. It is mostly seen in parks and large public gardens and the reason for this is the size of the thing. 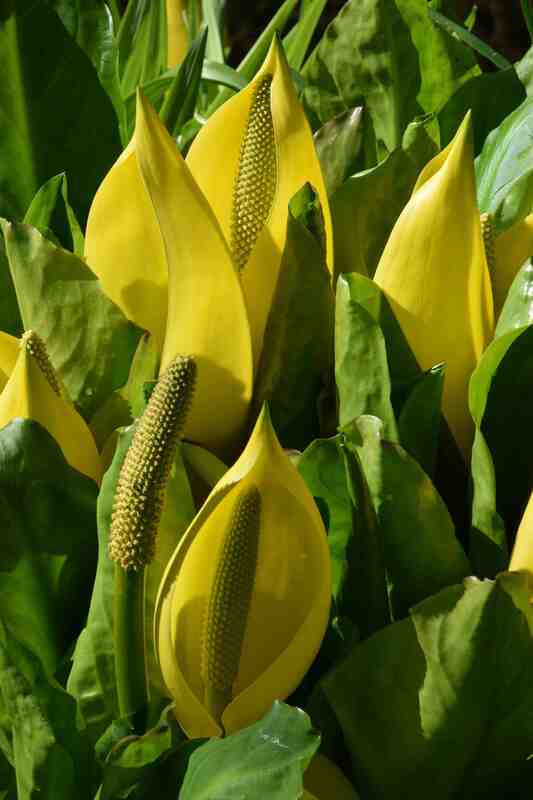 The thick rhizomes, engorged with starch from the previous season’s growth, are capable of producing great yellow, waxy spathes each with a thick green spadix that make every other flower in the garden look decidedly half-hearted. This aroid from the west coast of the USA and Canada was introduced into the UK in 1901 and had spread to most of Europe by 1950. I have seen it in the wild in Oregon where it grows in deciduous woodland in wet soil even when the ground and its roots are waterlogged. 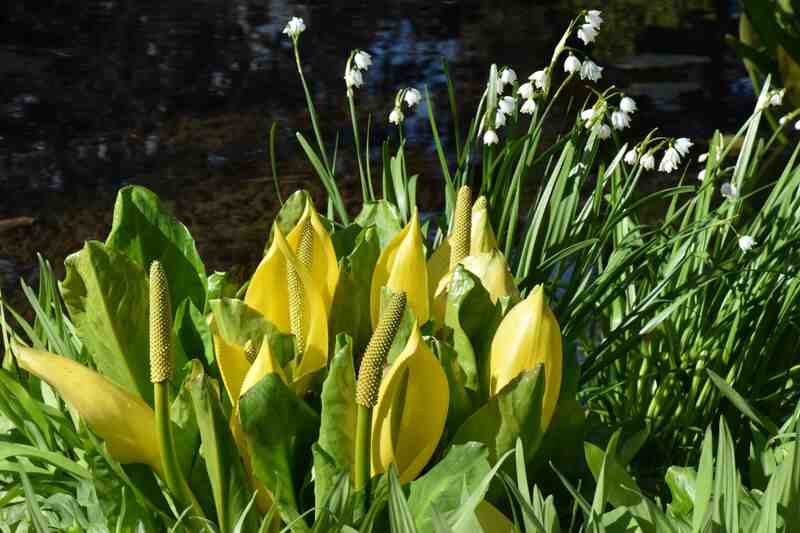 This proves helpful for the plant because the flowers are pollinated by flies and midges attracted by the slightly unpleasant (to humans) smell of the flowers – hence skunk cabbage. Despite this smell the plant was used as a famine food by native Americans but it must be eaten with care, in this case after a lot of cooking. Like many aroids (such as the UK and Ireland native Arum maculatum) the plant is full of calcium oxalate crystals that are needle-like and make consumption very painful. It is because of its great size that it is rarely planted in gardens. The ‘flowers’ are about 45cm high and once these are faded the leaves expand and these can reach almost 80cm in length making each rosette more than 1m wide – it takes up a lot of room. Yet if you have lots of boggy soil or a stream to plant this may fit the bill perfectly. The plant grows all along the western seaboard of the USA and Canada and in to Alaska – no problem with hardiness here. Apparently bears eat the rhizomes when they emerge from hibernation. Presumably a bear smells so bad after five months in a cave that the smell of skunk cabbage hardly makes much difference. West of the Bering Strait this plant is replaced by the similar but white-spathed Lysichiton camtschatcense. When brought together, in cultivation, the two hybridise and the offspring is vigorous with pale yellow flowers, intermediate between the parents. The plant spreads primarily by seed. 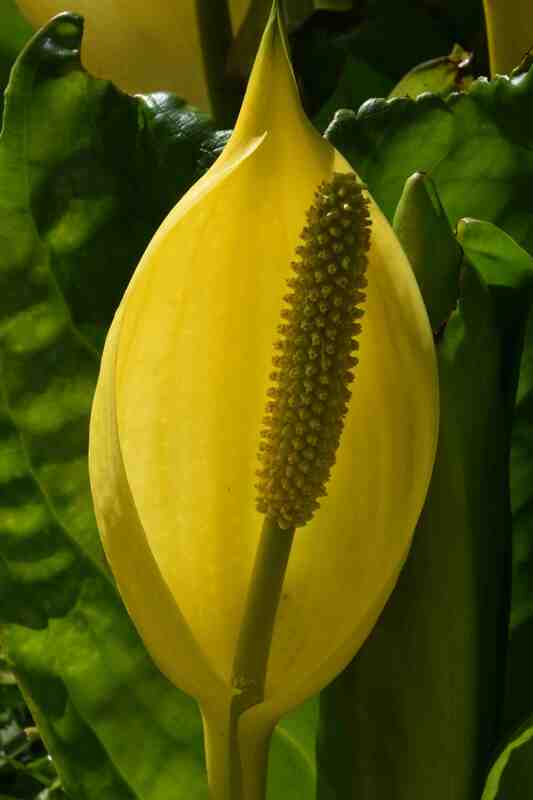 The individual flowers are tiny and green with the male flowers at the top of the spadix and female flowers at the base, though some are hermaphrodite. These seeds allow the plant to spread easily downstream and in the UK, Ireland and other parts of Europe the plant has escaped, or been deliberately ‘dumped’, and is thriving in the wild. Although it may not be the most important ‘alien’ because of its need for wet soil, its large foliage will smother native plants. 4/10 – I don’t have the room!